I got up at 3am this morning, so I’m feeling a bit zzzzzzzy at the moment. What made me get up at stupid o’clock? Something exciting happening in the night sky? Another chance to see Comet Lovejoy shining weakly above the treetops before it fades completely from view? The launch of a fantastic new space mission? No. I got up to watch a live webcast on my laptop, something I could easily have caught up with hours later, in daylight, after a good night’s sleep. I got up specially to watch a live broadcast of a NASA event celebrating the tenth anniversary of the landings of the Mars Exploration Rovers on the Red Planet (and before anyone says anything yes, I know it’s not quite ten years since Opportunity landed, but it’s near enough, and if NASA wants to celebrate a little early that’s fine by me! When the ACTUAL tenth anniversary comes around there’ll be a special post here with a new MER astropoem, so keep an eye open for that, ok?) Why? Because I wanted to join in the celebration as it happened, and watching it later just wouldn’t have been the same. So, 3am came, my alarm burst into life, and ignoring the protesting chirrups of the cat up I got, grabbed my laptop, went to the streaming coverage, and settled back under a duvet on the sofa to watch, a little bleary-eyed and yawny but there was no way I wanted to miss it. Because, you see, I was there at the beginning, and have been every day since, and I have vowed to myself, and to the rovers too, I guess, that I’ll be there at The End, whenever that comes. SO there was no way I was going to miss the party. 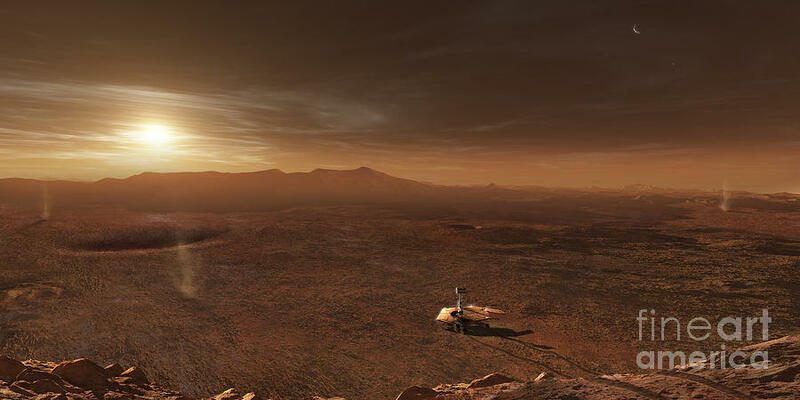 It’s almost impossible to grasp the fact that it’s now a decade since Spirit and Opportunity landed on Mars, and a good couple of years longer since they started their epic journeys to Barsoom by being designed, then built and eventually launched. But my own love of Mars didn’t begin with the rovers, oh no,. I’m a lifelong martian enthusiast. I remember as a kid drooling (not literally, that would be disgusting, but you know what I mean) and gasping over images taken by the Viking landers in books and magazines, and on TV too. I was so bewitched by the views of the rubble- and boulder-strewn Chryse and Utopia plains I saw spread across the pages of a 1977 National Geographic that I found in an art room at school that I “borrowed” it and took it home to drown in the glorious pictures. It’s still on one of my bookshelves over there, slightly faded and worse for wear now after more than 30 years of examination, study and love, sandwiched inbetween NASA reports and journals, big glossy coffee table books full of spectacular images, and dozens of sci fi novels about the exploration of Mars. (The school shut long ago, they won’t be wanting it back now… right?) As I grew older my love of Mars grew too, and so when the MER rovers were approved I followed their construction and became a huge fan of the mission. When the rovers launched I watched the launches live on my computer. This was in the days before I had broadband, so I watched the launches on tiny little RealPlayer windows over my dial up connection, and the video kept freezing, and buffering, but I was able to see the rovers launch safely… and then had to settle down and wait for their landings on Mars. Watching those landings was horrible and fantastic and frightening and thrilling all at the same time. I sat for hours, HOURS at my computer, following the events on that little buffering RealPlayer window over my dodgy dial-up connection, and my heart was in my mouth as the Big Moment arrived for the rovers, first Spirit and then Opportunity several weeks later. There was that awful period of uncertainty after landing, when no-one seemed to know what was going on, if the rover had survived, and then the cheers and the claps and the whoops… what a relief! Both rovers down on Mars safely. Let the adventures begin! Ahead of us, if we were lucky, lay a month – a whole month!! – of driving around Mars, studying its fascinating rocks, seeing different landscapes and new horizons every few days… If we were lucky. No-one I knew then, or know now, dared to imagine for even a fleeting moment that ten years and many, many miles later, one of those rovers would still be driving on Mars, still exploring, still making discoveries. But Opportunity is. Sadlly, Spirit’s mission came to an end about 4 years ago, when she became stuck in a sand trap and could not drive free. Like a fly trapped in amber, or a baby mammoth trapped in a tar pit, she could not escape and no-one could pull her out, so she died there, killed by the cold, starved of solar energy. “Rover Huggers” like myself miss her still, and find it impossible to wonder what she would be doing now if her wheel hadn’t dug into that talcum-fine dust, but still…. …and that has to be worth celebrating. Which is why I got up at You’re Having A Laugh o’clock this morning to watch the NASA event. I’ve followed this mission, been caught up in its adventure and excitement, since Day 1. It feels like I’ve walked alongside the rovers on their epic treks across the face of Barsoom, walking over the rocks and boulders, edging my way down the slopes of the craters and back out again, hiking up the hills and mountains, muscles burning, breath gasping, with one hand on the rover for support. Through my monitor screen, NASA videos, and online space exploration forums I’ve lived through each and every triumph and failure. The MER mission has been my Apollo. I’ve not just lived and loved it personally but, through my Outreach work in schools and to other interested groups I’ve shared it with many, many thousands of other people too. So, you can appreciate, to not be there this morning – at least virtually – as NASA celebrated the MER mission was unthinkable. I remembered the feelings of rage, frustration and helplessness that wrapped around me like a cloak when Spirit fell into the fiendish dust trap laid for her by Mars and could not get out again, despite the brave attempts to free her by the MER teams back on Earth. I remembered the rover falling silent when she eventually grew too weak to phone home again, and remembered waiting for the “I’m awake…” message which never came. And I remembered having to let her go when it became clear that her mission was finally over. And I remembered how it has felt to be a part of this mission, both as a space enthusiast and an Outreacher. 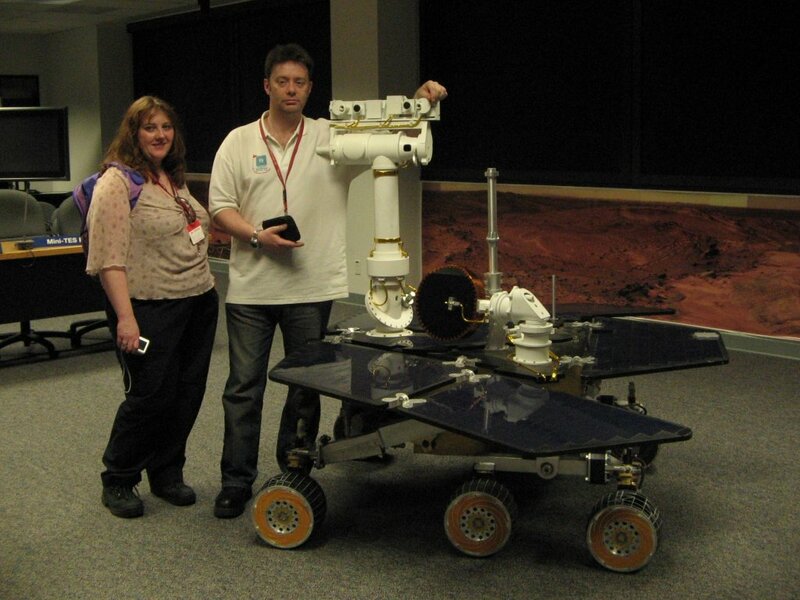 As a space enthusiast I have spent the past ten years writing about the MER rovers in children’s books and astronomy magazines, on my own blogs and on other people’s, and in posts on Facebook, Twitter and space exploration forums. I’ve written dozens of poems about them, and short stories too. As an Outreacher I have talked about the MER mission to probably tens of thousands of people, young and old, in drafty church halls, Lottery Grant-modernised Community Centres and school classrooms. I’ve shown hundreds, probably thousands of MER images to people, in the past decade, trying, hoping to put across what an incredible achievement they are. Five years ago I started this blog, “The Road To Endeavour”, and have updated it almost every day since – apart from brief pauses due to illness or work commitments or, more recently, Comet ISON and, sadly, family bereavement – which has led to it becoming one of the most popular MER-related blogs on the web, which is very gratfiying and humbling! In short, I have lived the MER mission myself. But why? Why has it had such an effect on me? Why have I felt so excited by it, been so possessed by it? Because I have been fascinated by Mars since I was knee high to R2D2, and the MER rovers have taken me there. This is because, early on in the mission the historic and incredibly generous decision was taken by the top people on the MER team to release the raw pictures taken by the rovers almost in real time, without being held back, or embargoed, without being processed or tweaked in any way. 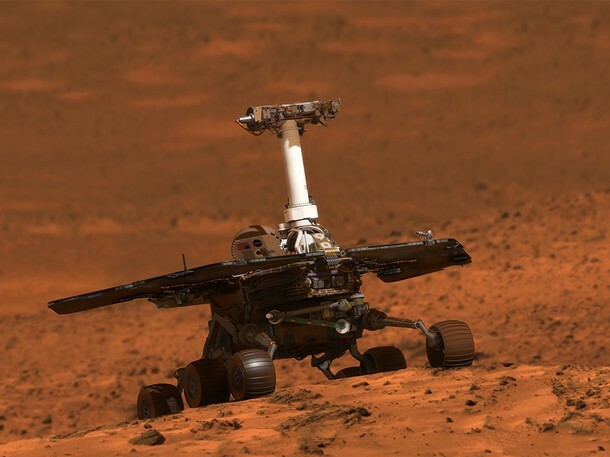 This meant that anyone with an internet connection could go to a webpage and see images of Mars taken by the rovers just a matter of hours previously. No censorship, no delay, just absolute freedom to participate in the mission and, through those images, join in with the exploration of another WORLD. 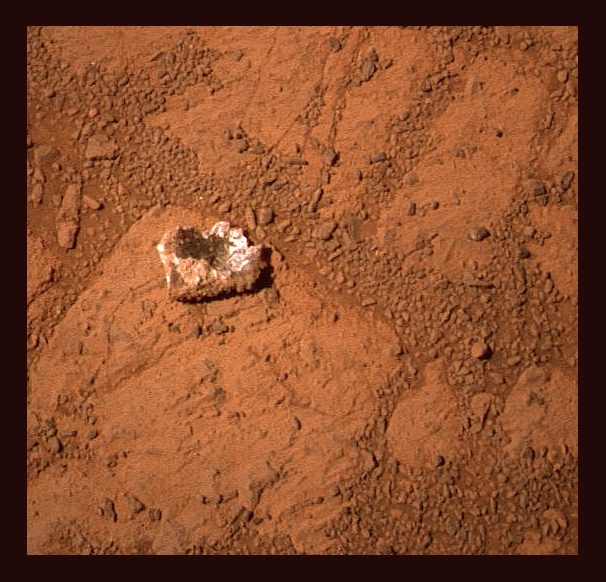 And that’s what I’ve done, almost every day since landing – gone online at some point and brought up the latest images from Spirit and Opportunity. That has allowed me to walk virtually across Mars alongside the rovers, my hand resting on their sides, crump-crumping across its rock-strewn surface, kicking up cinnamon-hued dust with my boots, dragging my space-suited fingers through its icy orange dirt… I feel like I’ve been on Mars for the past decade. Spirit and Opportunity aren’t just machines, you see. They’re every quiet kid that ever hid in a school library at breaktime, devouring science books instead of pretending they liked kicking a ball around outside. They’re every weekend hiker and walker who has trekked up a hill, stood panting on the top, and wondered what was beyond the next horizon. They’re every landscape painter who has struggled to capture in paint, on canvas, a burning sunset or icy Moonrise. The rovers are me. They’re you. They’re all of us. Reading that I’m sure some of you will have laughed, or rolled your eyes, or both. And yes, it’s true, strictly speaking, of course, Spirit and Opportunity are just robots – heartless, cold machines made of glass and metal, wire and cord, plastic and paint. But oh, they are so much more than that. They’re a warm, thinking, feeling human presence on an alien world. They’re the curious, wide-with-wonder eyes and shaking with excitement hands of intelligent, inquisitive, stubborn, frightened, fearless creatures that evolved from apes to build machines which could travel to, and explore, other worlds. They’re explorers, as brave and bold as Magellan, Columbus and Cook, and ships of exploration, just like the sleek, surf-sprayed, seagull-circled sailing ships of years time by. They’re connected to our past, and they connect us to the future too. And, like other pieces of space hardware scattered across the surfaces of planets and moons across the solar system – the descent stages of the Apollo landers on the Moon, the corroded Venera probes on Venus, the Huygens lander on Titan – they’re proof that, at least for a while, Mankind had the vision, the daring and the sheer guts to reach out from Earth and touch the faces of other worlds. The future can’t be seen, or predicted. Mankind’s destiny may be to leave Earth and walk on the surfaces of other worlds, first those orbiting our own star and then those in orbit around other, distant suns. Or it may be to cower in the smoking rubble of our civilisation, in the aftermath of war, or plague, or some as yet unknown horror. But whatever happens, Spirit and Opportunity will still be there, on Mars – either out in the open, exposed and covered in dust, or on display in some martian museum, brushed and scrubbed clean, lit by spotlights and surrounded by gawking crowds – proof that once, at least for a while, we looked at the sky and saw opportunities for adventure, knowledge and discovery there. Right now, Spirit is still standing there in the shadow of Husband Hill, frozen and lifeless, her solar panels coated with dust and ice no doubt. 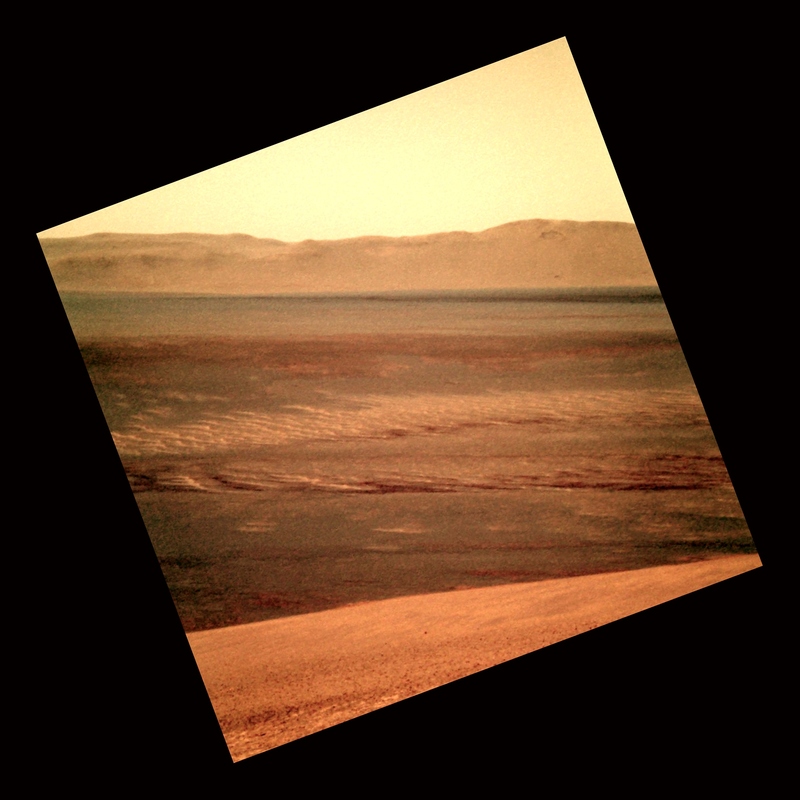 But Opportunity is, at this very moment, as you read these words, surveying the martian landscape from high up above an ancient impact crater. The sky above her is cold and clear, butterscotch-hued with subtle watercolour washes of orange, lemon and cinnamon, and the Sun shining on her back is shrunken, small and cold, a tiny silvery coin hanging in the sky. Unseen by anyone, unheard by anyone, she is exploring the great and ancient world of John Carter’s Barsoom, HG Wells’s stomping war machine tripods and Ray Bradbury’s silver-masked, golden-eyed martians. Isn’t that an amazing thing? See? 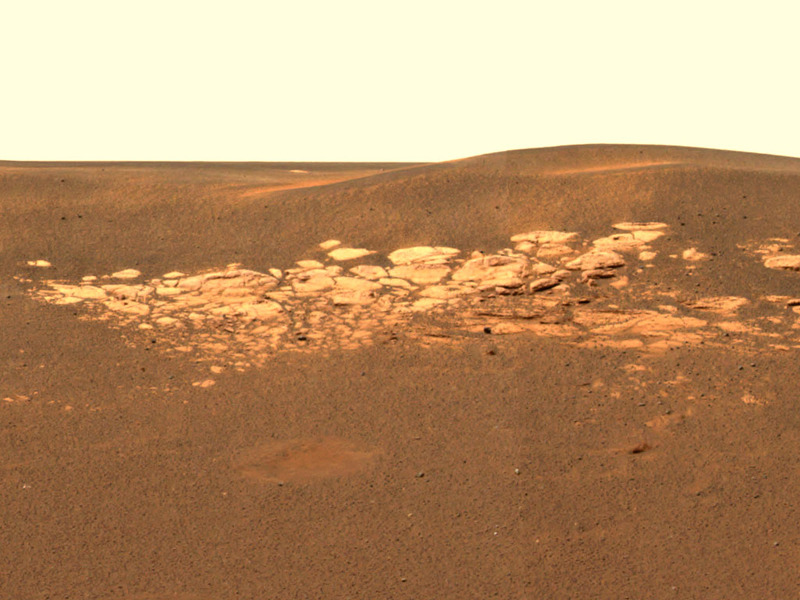 Almost ten years after landing on Mars Opportunity is still making discoveries, still leaving scientists scratching their heads, still surprising us. And that’s what makes her, and the MER mission, so special. 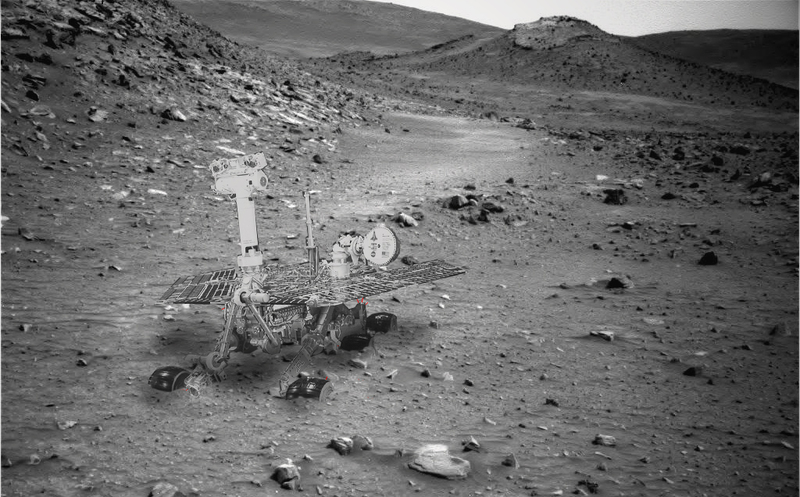 So far no probe – rover or lander – has found any signs of life on Mars. But don’t be too sad about that. Having been on Mars now longer than she was on Earth, having had the martian wind blowing over and through her for a decade, covering her with dust, Opportunity is a martian now, surely? It’s been a wonderful ten years, and I feel lucky, and privileged, to have been able to follow and, in my own small way, through this blog, and my poems, be a part of the MER mission. I really, really missed your blog(s) Sorry about Ison 😦 But great to have you back!!! And yes: “Ahead of us, if we were lucky, lay a month – a whole month!!”. It’s SO easy to forget how exciting and absolutely mind-blowing the prospect of a whole month looking around ANOTHER PLANET was!!! What would it reveal? At last we might possibly get some sort of “solid” sense of what a little bit of Mars was like, and what was to be found — a whole month of roving would deliver a thousand-fold better sense than previously, and could hardly be dreamt of. BUT IT’S GONE ON FOR TEN YEARS!!! Who could possibly have imagined?? Anyone who’s followed the journey now has a real, tangible feel for what another planet, a place usually over a hundred million kilometres away, is actually like!!! What an absolutely stunning, stunning thing! Surely one of the largest, completely-unexpected, totally “free” bonuses, thrown into each person’s lap, that most of us have had in life? How can this be conveyed adequately to the masses, who seem determined not to hear?? Dunno. But your postings make some of the best efforts.